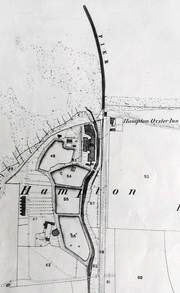 The settlement at Hampton changed dramatically in the years from 1864. In July that year the Herne Bay, Hampton and Reculver Oyster Fishery Company was set up to farm and fish oysters. 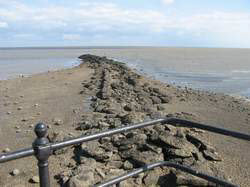 Oysters thrived in the shallow water along the north Kent coast from the Medway estuary to Herne Bay. 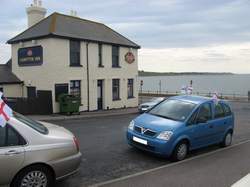 The oyster fishing company in Whitstable, five miles west of Herne Bay, was flourishing, and the aim of the new company was to exploit the oyster supply around Herne Bay. 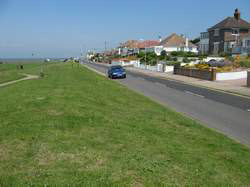 An Act of Parliament was passed that gave the company the right to fish for oysters along a six mile stretch of coast from Hampton to Reculver. My information on the oyster industry at Hampton-on-Sea comes from Martin Easdown's book Adventures in Oysterville, Michael's Bookshop, 2008. Much of the later information in this section comes from the same book. An alternative source is the excellent article on Hampton-on-Sea in Wikipedia. The main centre of operations for the new company was at Hampton. Dredging for oysters was carried out up to three miles from shore. 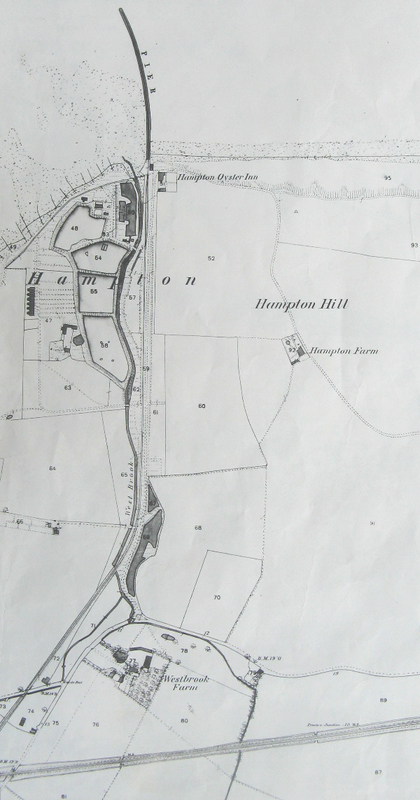 In addition four freshwater ponds were constructed at Hampton for breeding oysters, the water to the ponds being supplied by the West Brook that flowed along the west side of Hampton Hill. A pier over 300 metres long was built close to the mouth of the West Brook. It was used by the company's own vessels, and also by other ships bringing building materials and oysters from elsewhere. As well as being used for dredging, the company's boats, known as yawls, would transport oysters twice a week to Billingsgate fish market in London. On one occasion the yawl sailing to London collided with the yawl making the return journey. From the pier a tramway was built that ran about three quarters of a mile inland to join the line of the London, Chatham and Dover Railway. Trucks on the tramway were usually drawn by horses, but sail power was used when the wind conditions were suitable. The company provided accommodation for staff by building a terrace of twelve houses at Hampton. 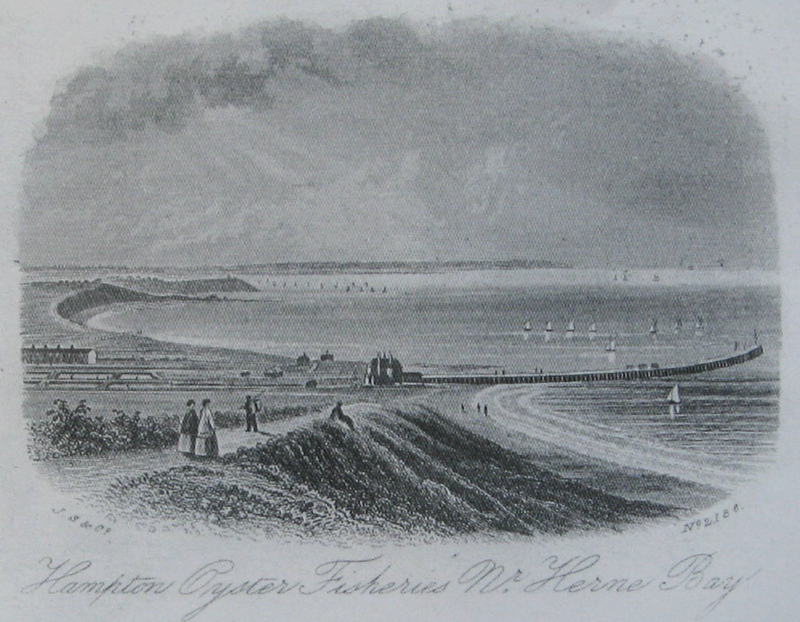 In addition a public house, the Hampton Oyster Inn, opened near the foot of Hampton Hill close to the pier. The Herne Bay, Hampton and Reculver Oyster Fishery Company was not successful. 1872 was the only year in which a dividend was paid to shareholders. The capital investment, especially the cost of the pier, was higher than expected. The company had to deal with opposition from the Whitstable Oyster Company, in 1866 being required to give evidence to a committee of the House of Lords in response to a bid by the Whitstable Oyster Company to extend its fishing rights. You can read the evidence given to the committee in the Internet Archive website. In 1869 there was a dispute with local fishermen who complained that the Herne Bay Company interfered with their rights to fish for and collect whelks, periwinkles, mussels, and other fish. HMS Buzzard was called in to protect the company's fishery. One fisherman, Judah Downs, complained that the tramway had been built across land leased to him. His lease covered forty acres close to the shore, where he had built a weir of stakes in which to trap fish. His dwelling, close to the weir, was described as built upon piles, apparently of the jetsam and flotsam of the ocean, a compound of old boats, wrecks of ships, and tarred brown paper. The observer predicted that on a stormy night Judah, house and all would certainly disappear from the face of the earth. The company was obliged to pay compensation of £900 to Judah Downs. As it happens Judah Downs escaped the fate predicted by those who saw his home at Hampton. At a later date his property, known by Downs himself as his manor, was bought by the company. He moved a short distance inland to the village of Herne, where he died in 1882 at the age of 85. Poor weather also contributed to the company's difficulties. In particular three severe winters in the 1870s caused the death of many of the young oysters in the breeding ponds as the water froze around them. The oyster fisheries, a view from the east. 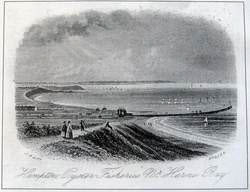 This engraving, made in the late 1860s, shows the pier, the oyster company’s buildings, part of Hampton Terrace (later Hernecliff Gardens), and the position of the coastline at that time. The remains of the outer section of the pier. You may just be able to make out the wind farm in the distance, a splendid and heart-warming sight. Part of the embankment that carried the tramway. Hampton Inn, originally the Hampton Oyster Inn, in a photograph taken in June 2010.